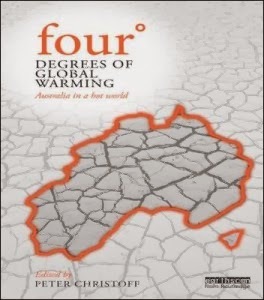 As Christoff notes, ‘this four-degree world is one of almost unimaginable social, economic and ecological consequences and catastrophes’ but, given current international and Australian energy and climate policies, it is “an impending reality”. The book contains contributions by Australia’s leading scientists and economists, including Ross Garnaut, David Karoly and Will Steffen, setting out a four-degree future across the ecological, social and economic impacts, and the adaptation that will be required. Previously, climate change dialogue has mainly focused on two degrees Celsius of global temperature rise, which had been identified as a key environmental “tipping point”. Scientific consensus is now that our business-as-usual trajectory will cause the global average temperature to rise by a global average of four degrees Celsius above pre-industrial levels by 2070-2100. Nonetheless, regional increases will range from four to sixteen degrees on land, with the Arctic continuing to heat up the most, as it has done to date. One of the key insights from Four degrees or More? is that almost nothing about the consequences of climate change will be uniform. To better represent changes across Australia, the book’s initial chapters match Australian cities with places with climates currently analogous with those that these cities will experience in a four-degree world. So Sydney becomes Rockhampton and Brisbane becomes more like Cairns. Broome, which currently has 54 days a year over 35 degrees is projected to have 284 days per year over 35 degrees by 2100. Darwin will be like be like nowhere on earth; the researchers could find no analogue anywhere on earth to a Darwin under a four-degrees scenario. The possible consequences of these changes for Australia’s population are not explored in the book. This would be a valuable exercise for geographers and urban planners. One might assume that some northern Australia’s inland settlements will be abandoned. Meanwhile, Tasmania is likely to be a haven from the heat. At the book’s launch, the number of climate scientists who own land in Tasmania was remarked on. Penfolds and Brown Brothers have already purchased land for new vineyards in Tasmania, the wine industry being one that is highly climate dependent and (at least in some companies) very alive to how the climate is already changing. The impact of climate change on the marine environment is not as visible but the consequences are worrying indeed. The basic science means that as carbon dioxide levels in the atmosphere increase, some of it dissolves in and acidifies seawater. The world’s oceans have already acidified by almost thirty percent since the Industrial Revolution. Further ocean acidification will disrupt the marine food chain, making it more difficult for organisms to form shells and skeletons, and leading to the decline or collapse of coral reef ecosystems. Over 2.6 billion people depend on the seas for their primary source of protein. As Four degrees highlights, overfishing is just one of a multitude of examples of where climate change will exacerbate, accelerate or multiply an existing unsustainable trend. The emission of greenhouse gases is only one way in which humans have fundamentally altered the planet’s biosphere and ecology. Other examples of the numerous negative feedback effects caused by climate change include the strengthening of the urban heat island effect (which already exists as a result of the sheer coverage of paved areas and building mass in most cities) and increased riverine salinity due to the extraction of ever-decreasing amounts of water for agriculture from rivers such as the Murray Darling. Four degrees discusses how Australian food yields will in decline in quantity and quality as the protein content of grain crops decline. By 2100, Australia – currently a net food exporter – is likely to face food shortages in a world where half of the global population also faces droughts and famine. A Four-degree world will also affect human health in other ways. As the January heatwave has underlined, temperature extremes and related events have profound health consequences. Such extremes will become more frequent and ‘normal’ as global warming accelerates. Heat is a silent killer. The 2003 European heatwave is estimated to have caused up to 70,000 excess deaths. The Black Saturday bushfires in Victoria in February 2009 killed 173 people, but an additional 374 people died as a consequence of the accompanying heatwave. Children, elderly people and those with underlying health conditions are particularly vulnerable in extreme heat, as are the services and systems that might otherwise support them. In addition, a wide variety of health risks will become more common and more extreme in a Four Degree world, ranging from increases in air pollution and aeroallergens (affecting asthma sufferers, in particular) to changes to natural constraints on infectious agents (such as malaria and Ross River fever) to psychological (mental health) effects. Crucially, it is the indirect effects of climate change on water and food security, alongside extreme climatic events, which are likely to have the biggest effect on global health – and indeed the movement of people around the globe. As McMichael, Steffen and Griggs highlight in their chapters, there will be complex interactions between climatic impacts. For instance, persistent drought will reduce food production, leading to food shortages, and perhaps emigration, conflict and violence. Globally, by the end of this century, up to one billion people will be displaced by climate change as populations try to move towards more survivable climates in the biggest wave of forced migration in human history. Sea level rise is already influencing emigration from Tuvalu, Kiribati, Papua New Guinea and the low-lying Carteret Islands, while water stress is propelling the relocation of people from Mauritania, Sudan, Ghana and Kenya. The Maldives has established a sovereign wealth fund to purchase a new homeland for the 350,000 islanders expected to become the first nation of people fully displaced by climate change. Closer to home, Indonesia has a population of 240 million and the fourth largest coastline in the world. Christoff and Eckersley note some 6.4 percent of Indonesia’s population live in the three metre zone prone to coastal flooding and suggest that climate change already locked in to the global system will result in the potential displacement of (at least) 15 million people north of Australia. Such detail is what is needed for adaptation planning by Australian governments, business and civil society. The book provides a welcome overview of the big picture; the next step is a more tangible picture of the specific changes to day-to-day business and lives in Australia. But that also requires more research. As Christoff highlights, there hasn’t, for example, been any economic modeling of the consequences for Australian tourism, trade and agriculture since 2008. It’s no wonder that some business finds it frustrating to operate with big picture warnings of massive disruption without the particulars for their industry. The indispensable crux of this book – the view of some of the world’s most eminent scientists and social scientists ­– accords with that of Professor Schellnhuber that ‘the difference between (two and four degrees) is human civilisation, if you like’. Dr Gabrielle Kuiper has been working on climate change in various ways for two decades and is currently an independent energy and climate consultant.